Besides looking great in mixed bouquets, gomphrena dries beautifully. Some of these might end up in wreaths this year! Mike is thrilled he doesn't have a cell phone, but should he ever decide to throw in the towel and get one, he'll be able to see his flowers on Instagram! If you'd like, follow yolopress on Instagram for a peek into life on our farm. Can you make jam without sugar? No, because in doing so you'll shorten the shelf life from a year to just a few days. How much sugar do you use in all of your jam or marmalade? It varies depending on the natural sweetness of the fruit I'm using. Can other kinds of sugar be used in jam and marmalade? Yes, with varying degrees of success! These are all great questions, and I thought it would be helpful to offer some insight into the way I use sugar. I vary the amount of sugar (which is white granulated sugar) in all of my jams, jellies, and marmalades depending on the fruit, the degrees of acidity and pectin, and the time of harvest. For example, in the beginning of blackberry season, some of the fruit is more tart and may require more sugar. A week later, it won't! Most of the fruit I process has medium to high acidity, and the same for pectin level. I also use a little unripe fruit to increase the pectin level. I don't add pectin, which is just a personal choice---the fewer ingredients, the better! My goal for every batch is a delicious jam with a safe shelf life for the end user. Taste is key, but shelf life is also important. Using very little sugar may make a delicious jam that has a short shelf life and the fruit may turn dark quickly. If you're thinking about trying your hand at making a jam, jelly, or marmalade, I recommend doing lots of research about the type you're interested in. There are many cookbooks and recipes that provide detailed explanations of the reasoning behind each step in a recipe. Taking a class through Cooperative Extension or with an experienced jam maker is also a great way to learn. Remember that if you're making jam for gifts that you'll be giving a few months away, you'll want it to have a longer shelf life. Many people 'save' those special gifts for a future breakfast, and you'll want that jam to taste good when they open it! I spent most of today making a beautiful batch of Plum Jam with my favorite varieties: 'Sprite' and 'Delight.' Luckily, both are grafted on to the same tree. It has been raining plums this week---plop, plop, plop---and fortunately the squirrels are busy in the neighbors prune orchard and haven't found ours. 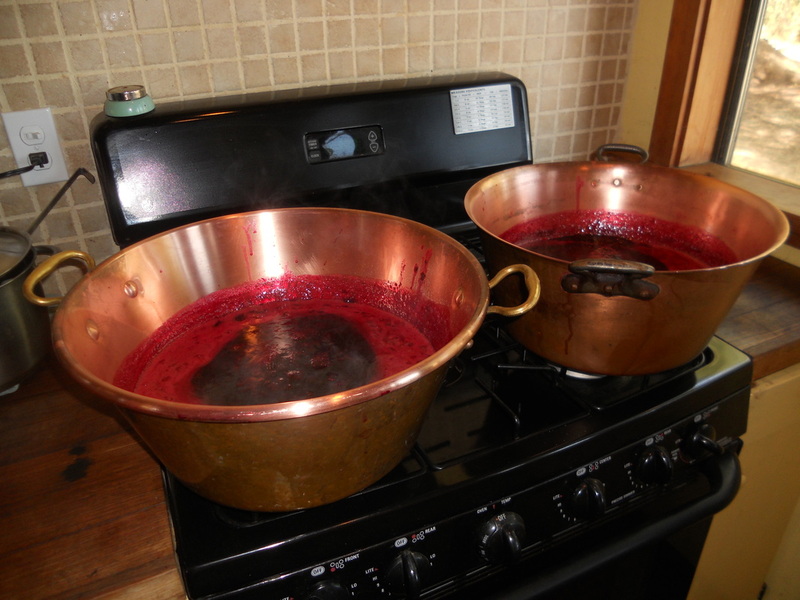 Everything in the jam kitchen has plum stains, that nice deep reddish-purple, and it smells wonderful. With some prodding from our tech-savvy daughters, we've established this website to share photos, news, and product information with our customers and friends. We'll be using this blog to keep you updated with the latest news from the farm, and hope you take a moment to share the site with your friends and family! The farm blog brings you the latest Yolo Press news, photos, and anecdotes about life on the farm. Want to see more? Follow us on Instagram!